Authenticity has become popular as a concept. It has also become a badge of honour and standard of approval. Authenticity in its essential form comes back to being yourself, or further being true to oneself. However, as a buzz word it has led to misinterpretations that can be conflictual. 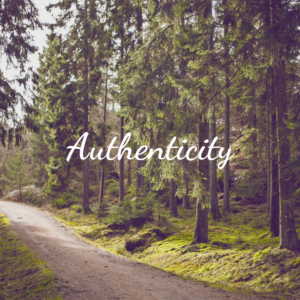 Below I share 3 of my struggles with authenticity, summing up why I prefer not be called “authentic”. 1. Authenticity leading to Judgement: Authenticity can be interpreted as being “real”. Authenticity and real are of those dualistic words. Where there’s authenticity, there’s in-authenticity, where there’s real there’s fake, or sub-par. Using these terms creates division around what’s seen as real and what’s not. Using terms such as “a real …man/woman/mom/dad/ boss, etc.” forms standards that isn’t the reality for many who fit said category in other ways. So when authenticity becomes a standard, judgement can ensue. Which goes against most of what this term is intended to be. While I’m supportive of being true to oneself, I remain aware of how this can create judgement, particularly judgement of others. Embracing living in line with core beliefs, in an open manner can be free-ing and empowering. However, comparing or evaluating ourselves and others to yet another standard can take away from the benefits. 2. Authenticity as a Privilege: When embracing and celebrating authenticity it’s important to remember that not everyone has the same privilege to be their true self. While it can be argued sure we do, just shrug off consequences. The limitations, consequences, potential discrimination and risks, related to one being their true self can vary person to person. To use a simple personal example, I’m mindful of my attire, in ways someone else may not be. I have spoken with other persons of colour/marginalized identities who share similar limitations. In that there’s consideration for the implications of simple things such as hoop earrings, cultural accessories and/or garments. Certain accessories on my being can be met with hate, discrimination, and put me at risk, where on others simply seen as exotic, Bohemian, or chic. Context can dictate much, inequalities, laws, social norms/expectations can suppress the capacity for some to be their authentic self in a way that it doesn’t impact others. So again, while great to have more people being themselves and embracing authenticity, lets not forget it’s a privilege. 3. Authenticity doesn’t mean, always being your most vulnerable self: Concepts of authenticity are often paired with concepts of vulnerability. While like authenticity, vulnerability can be empowering to self and others, choosing to share of one’s vulnerable self is best done with contextual consideration. When pursuing living an authentic life, or embracing using vulnerability, it’s helpful to remember that boundaries still matter and serve a purpose. Brene Brown in Daring Greatly speaks of the power of vulnerability but also speaks to the importance of boundaries. Being true to ourselves may be more reflected in setting healthy boundaries versus the unmindful sharing of vulnerabilities. Making a mindful choice to use vulnerability doesn’t make one less authentic or contribute to “fake-ness”. An important part of being authentic/vulnerable is having healthy boundaries. These are some of the reasons why I struggle with being called authentic, or when I hear the word used as praise. My 3 year old is at a stage where he insists don’t call him handsome, don’t call him sweetheart, don’t call him love or baby, he’s James* and just James*! So don’t call me authentic, but call me Kameela, just me being me, not a standard to anyone but myself. As real as anyone else. Aware that it’s a privilege to be in my body, even though it comes with some forms of discrimination. Aware that being true to myself is a freedom, not everyone has. All the while, reassuring myself, healthy boundaries matter! *name changed for privacy, boundaries ?